Salmon spend 12-14 months in the net pens after moving there as fry, which is fast for the industry – credited to the nutrient-rich fast-flowing waters of the fjords. Nearby hatcheries raise them to around 250g before they are moved to the net pens, where they will grow to about 6 kg each before becoming dinner. Each site, with around 10 net pens, holds about 1 million fish in total during this growth process (at our visit, this amounted to 150,000 fish per pen). They are moved into progressively larger pens as they grow. The pens are the shape of an inverted grain silo, with 10 meter cylindrical walls atop a 7 m depth a conical bottom. They each have a platform of floating plastic around the edges for workers to access the nets and the salmon. Only once in a while does a salmon escape, when the occasional hole forms in one of the nets – these are later repaired by hand. Each pen is initially inspected by a diver before fish are placed in it, a large effort in the cold Faroese waters. There were 4 people working at the site in Vestmanna, which is average per site (sometimes 3, sometimes 5, but always close to that). For big jobs, the people at different sites coordinate to share boats and labor. The 3 major aquaculture companies – Marine Harvest, Bakkafrost, and P/F Luna (marketed under Hiddenfjord) – share equipment, fish, and dock space as needed for operations, largely depending on what is closer. Some of the staff switch between companies depending on what skills they have and want to develop. Collaborations help ensure the fish get care when needed and operations run efficiently, according to the national vision. Between sets of net pens, chugging along through the day, lies an old 140 ton feed barge with long tubes extending to each of the pens. Every 30 seconds or so, a dose of feed is pushed through these lines with a blast of air, keeping the fish in near constant supply during “cyclic feeding”. This is one of two schedules of feeding, both of which could be programmed into the computer controlling the barge. The other is to give the fish a huge pulse of food mid-day, when they’re most active. Especially during this second method, sensors are placed 7m below the surface to monitor food consumption – when the fish stop eating, the barge stops pumping. The salmon are fine with either, but get into a routine depending on what their caretakers usually do. They’re creatures of habit. 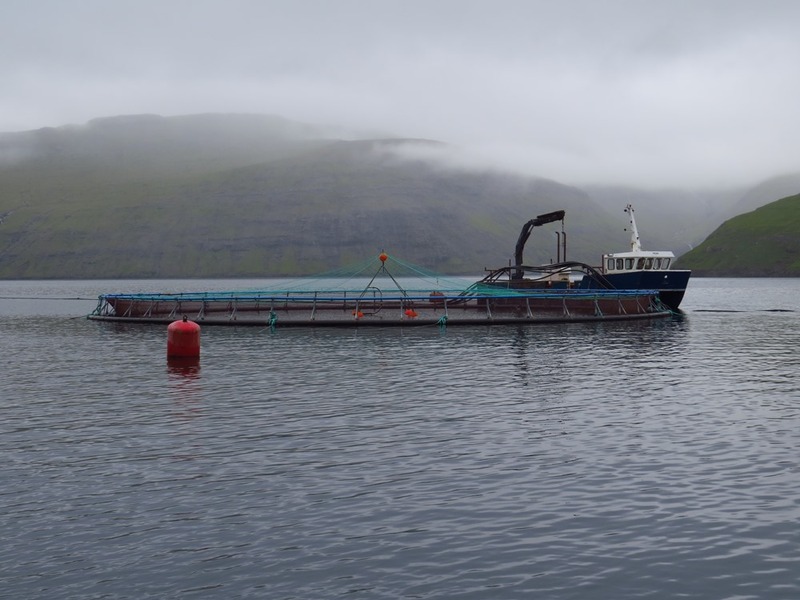 Unlike the other aquaculture operations in the country, Hiddenfjord prides itself on using only feed produced in the Faroe Islands, largely out of herring and mackerel turned into fish meal pellets. They’ve used fish oil, too, but it’s getting prohibitively expensive and are now using some soy and rapeseed oil as replacement because it is so much cheaper. Each net pen full of salmon consumes around 1 ton of food per day, the pellets of the food sized according to the mouth size of the hungry fish. Workers give some additional feed by hand to provide a bit of extra nutrition and entertainment in the fish’s day. The feed conversion ratio is 1.15-1.2 depending on how fast workers want the salmon to grow. When the market price is high, a little extra feed to get them on the table faster is worth it. On the flipside, rumors in town boasted of achieving a 0.7 feed ratio – and while this may have been an exceptional year, in a bigger company, or a single experiment, this is definitely a number to boast about. Greenberg writes in his book “Four Fish” that the holy grail for aquaculture is 1.0 – so the Faroese are approaching this holy grail, especially in more patient years. With 1 million fish to care for, some mortality is expected. 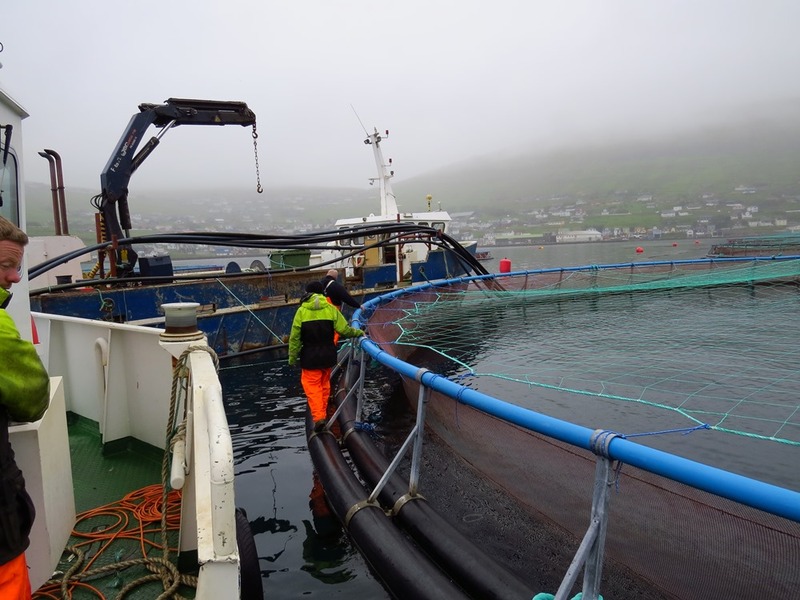 Hiddenfjord maintains about 5% mortality, while another local company Marine Harvest, maintains 1.5%, largely dependent on the mortality associated with transporting the fry from the hatchery to the net pens (these are both low compared to worldwide average). As with other forms of dense food production, pests and disease also loom as large concerns over the operations. These challenges change from year to year, depending on weather and temperature conditions, but there are a few that cause the growers consistent headaches. And in the Faroes, where fish do not receive prophylactic antibiotics or pesticides, these headaches can mean real financial loss to the operation. First is sea lice, which is somewhat of a recent concern. These are treated with a tarpaulin treated with hydrogen peroxide that slides underneath the net pen. The peroxide treatment then bubbles up and removes the lice. This treatment is expensive and requires a great deal of finesse, as sliding the tarp under a large net pen without letting the jumping fish out in the process can be challenging. Despite the downsides, it’s considered one of the safest treatments for fish destined for human consumption – so only the best. 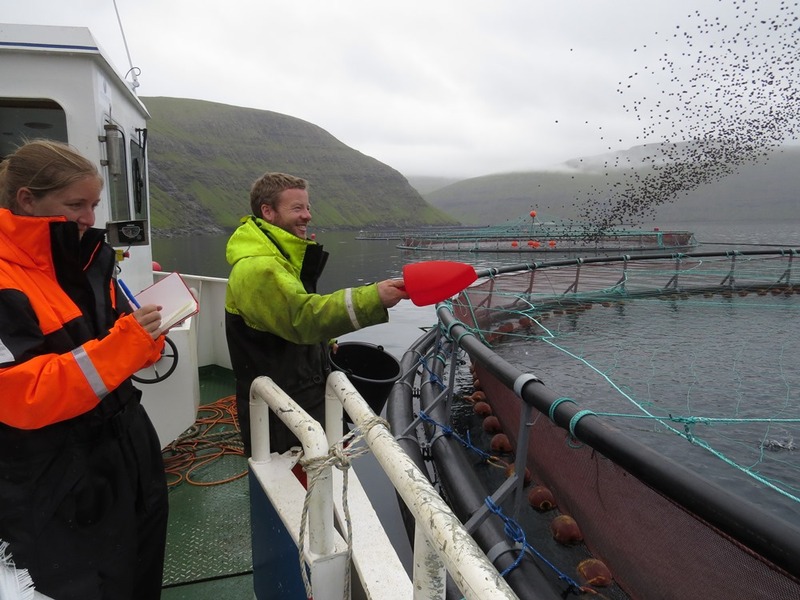 Worldwide outbreaks of the infectious salmon anemia virus (ISA) have helped the Faroese salmon market grow, as they’ve taken over the Chilean market in the last three years as they recuperate from an epidemic. Like many of the beneficial aspects of Faroese aquaculture, the fjords are helpful in preventing disease transmission. Each fjord is isolated and undergoes a fallow period after harvest to ensure the salmonid diseases have subsided. The government also plays a heavy hand here, sending in veterinarians every two months to check for ISA (every month for 3 salmon generations after an outbreak). Fish in disease-prone areas are each individually vaccinated for ISA. Dead fish sink and can be scooped out with a net, a practice that happens with the daily maintenance. A more complicated systems is called the China hat system, where dead fish are sucked out of the bottom of the nets, where they settle in the point of the conical part. Smaller operations with no system in place send a diver down to remove the dead fish. From there, depending on why the fish died, the bodies are converted into biogas or fertilizer along with the guts from processed harvests. In this way, the production wastes very little. All in all, the salmon cost about 21 dkk/kg to produce. Half of this cost comes from the fish meal required for their voracious appetites, so the cost fluctuates widely depending on the price for herring used to produce the fish meal. Right now, the venture is profitable because global demand for salmon is high and pays about 50dkk/kg; past years were not so great, as average price for the salmon was about the cost of production. Until the salmon are shipped to the UK for global distribution, they are fully Faroese – raised in their native waters from local stocks, fed from local herring, and partly recycled into local potatoes. It’s refreshing to see that salmon aquaculture can add to the local economy and fit into, even depend on, healthy commercial fisheries. Hopefully their distant consumers will come to understand what makes Faroese salmon so special. 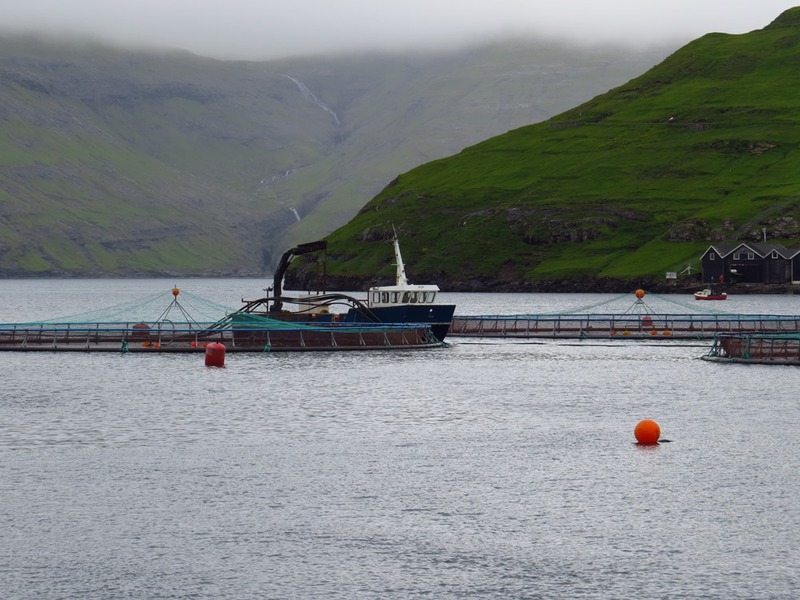 Currently the Faroes don’t have to abide by EU fishing quotas – while the feed conversion rate is admirable the herring biomass removed recently is grossly unsustainable and led to trade and port usage restrictions from the UK earlier this year. I must apologize on not having details to hand, currently on my phone. M.
Short version is the EU sanctions against the Faroes are a political maneuver, the Atlanto-Scandian Herring is among the best managed fishery in the world – the current conflict is not over the total allowable quota (which all member states agree to) but rather the Faroes’ allotment of that total quota, which is grossly disproportionate to the the actual number of herring in Faroese waters. Thank you for the link, a more rounded article than the heavy UK bias I’d encountered previously. Has there been any evaluation of changes in the benthic community under the pens? This was one of our major concerns with the tuna aquaculture done in Ensenada, of course the biggest concern was the sustainability of the sardine harvesting to feed the pens at peak operation. From my understanding, because the fjords are quite deep and have serious current (both wind-driven and forced by river inputs), the water at the bottom is likely unaffected by the pens. That being said, I’m not sure anyone has looks (again, because of the depth). In addition, the practice of fallowing fjords means that the pens are not a long-term presence or impact. The high water flow and natural productivity of the fjords is credited with the sustainability and quality of the aquaculture practices in the Faroes.